A 15 year old male was noted to have a paratesticular mass. Histology: The tumor consists of a cellular spindle cell and small blue cell tumor. Focally, one can appreciate some eosinophilic spindling of the cytoplasm. Some cells are anaplastic with large pleomorphic nuclei and markedly atypical mitotic figures. 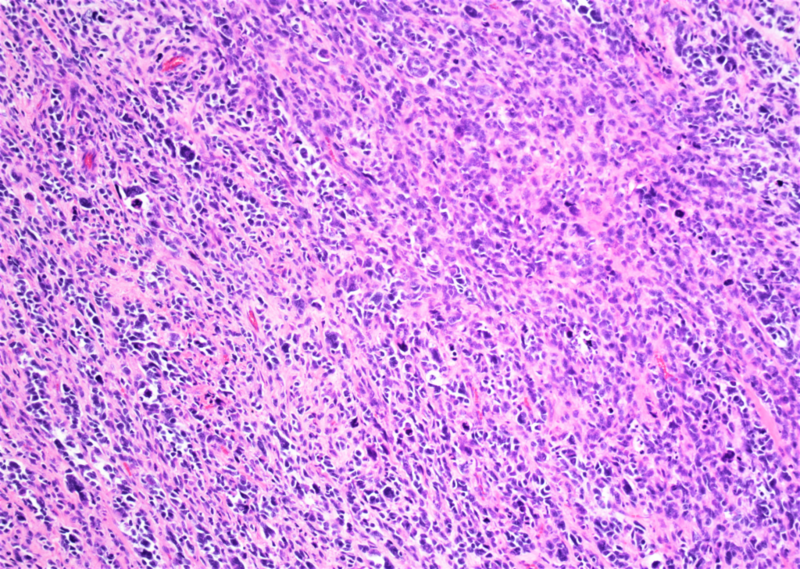 Discussion: The key issues in this case is the patient’s age and the location of the tumor. It is critical to distinguish intratesticular vs. paratesticular lesions since the differential diagnosis is for the most part totally different. 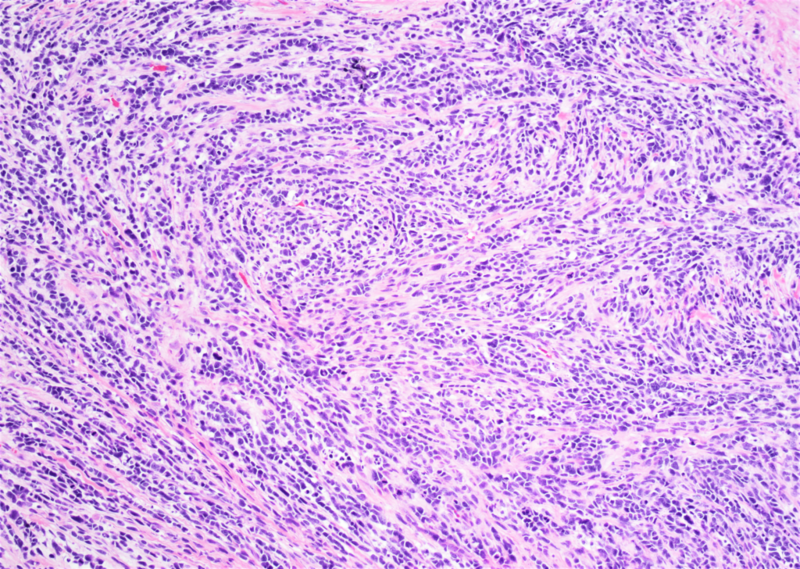 In the paratesticular region, an overtly malignant pleomorphic spindle cell tumor in an adult is almost always a de-differentiated liposarcoma and in a child or young adult, it is a rhabdomyosarcoma. This case, although there are some cells typical of rhabdomyoblasts, has relatively few cells with eosinophilic cytoplasmic tails showing overt skeletal muscle differentiation. 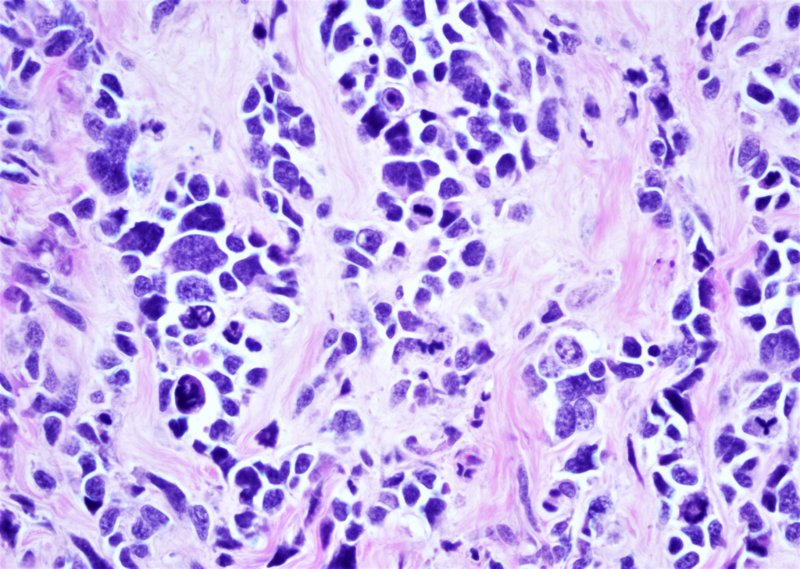 Some paratesticular rhabdomyosarcomas will have more cells that resemble skeletal muscle and in some cases one can even see cross striations. The current case is also exceptional for the pronounced pleomorphism and atypical mitotic figures. 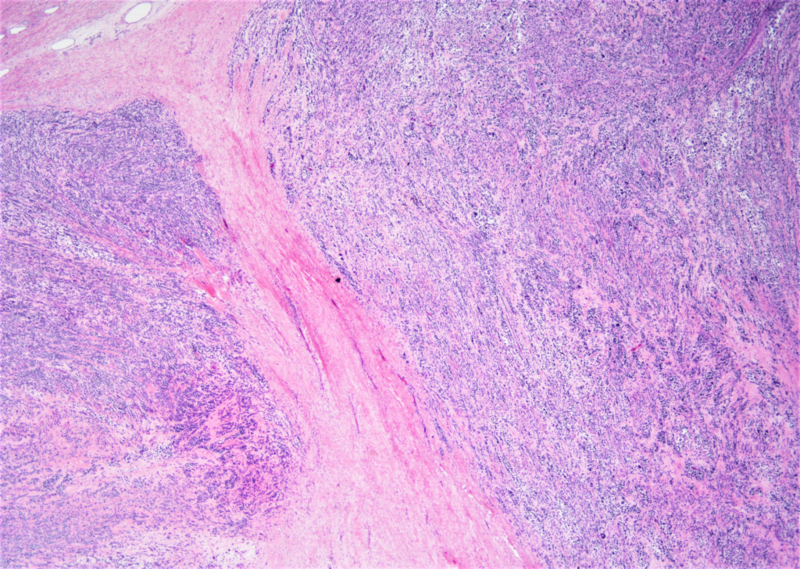 This case would be noted in the report as having anaplasia in an analogous fashion to Wilms tumor with anaplasia. Although there is scant literature on these cases, they appear to have a worse prognosis. The diagnosis can be confirmed with strong staining for desmin and also some immunoreactivity for myogenin. However, one must recognize that myogenin may label only rare cells.